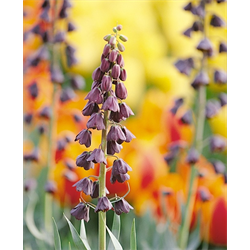 Pricing is per package and per fritillaria variety (quantity discounts apply). Placing a + in front of a term means that any matching products must contain that term. Placing a - in front of a term means that any matching products cannot contain that term. Example: +blue -black will return all results that match blue but DO NOT match black. Similar Placing a ~ after a term means that it will also return products that match similar terms to the one entered. Example: aluminium~ will also return all results that match similar to aluminium such as aluminum. OR The default search checks that ALL terms match a product but by placing OR between terms you can change the behaviour so it only has to match one of a group of terms. Example: blue OR black would return all results matching EITHER blue or black. Double Quotes By default the search matches based on each term appearing anywhere in a document. If you want to match items located together use double quotes. Example: "blue black" would only return results matching both terms located together. Grouping If you want to group terms using the different operators then group them in brackets (). Example: (blue OR black) -red would return results matching EITHER blue OR black but do not have red. Boosting If you want a certain term to appear at the top of the results then you can boost the specific term. Example: blue black^100 would return results matching both terms but would make those with black more relevant.